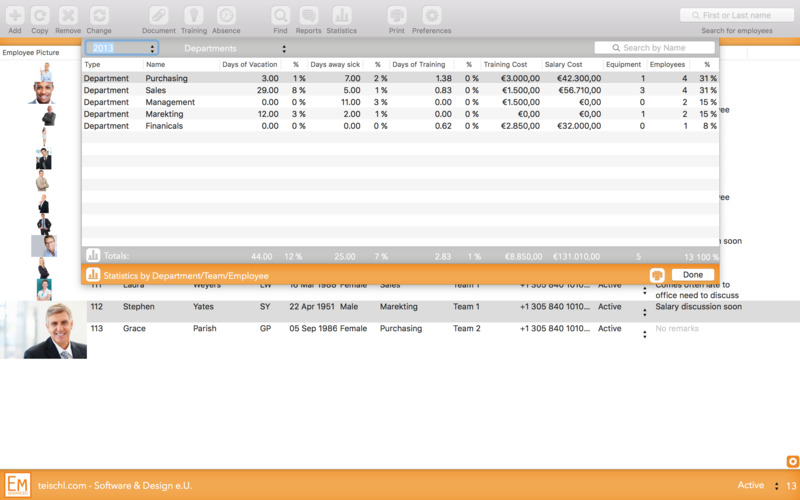 You want to manage your employees on your Mac? You need to get an overview of your HR and save costs? Our HR-Software is designed for small and medium companies, including features like personnel records, training and absence management as well as attached documents to your records. Furthermore you have the ability to manage your HR anytime with various sync options (depending on the employment:app Version)! Check out the price and feature overview right away! 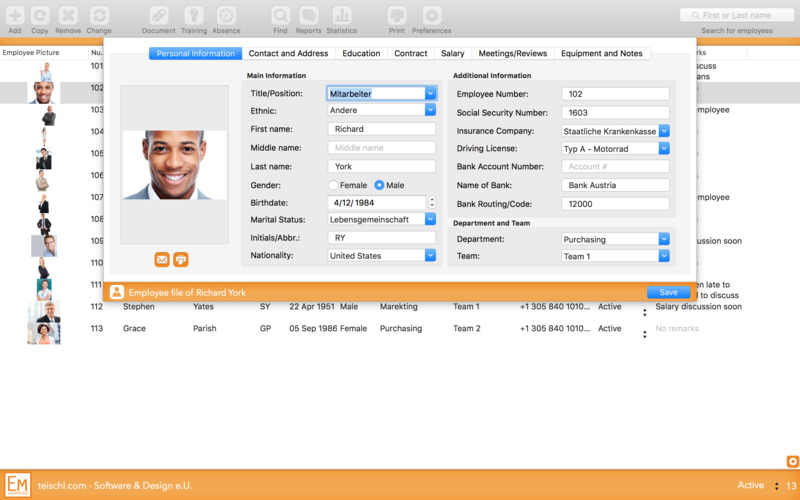 Our software combines all data into one place, basic employee data as well as absences and trainings. No nasty paperwork anymore! 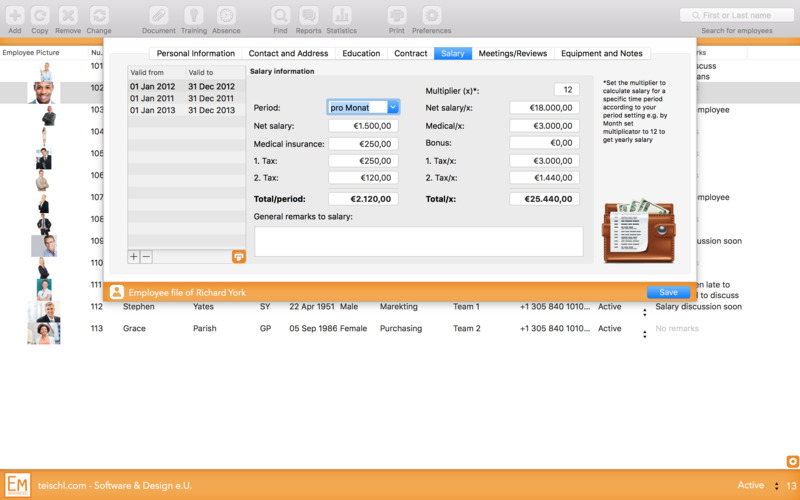 You can attach documents directly to your employees, that saves you a lot of time! 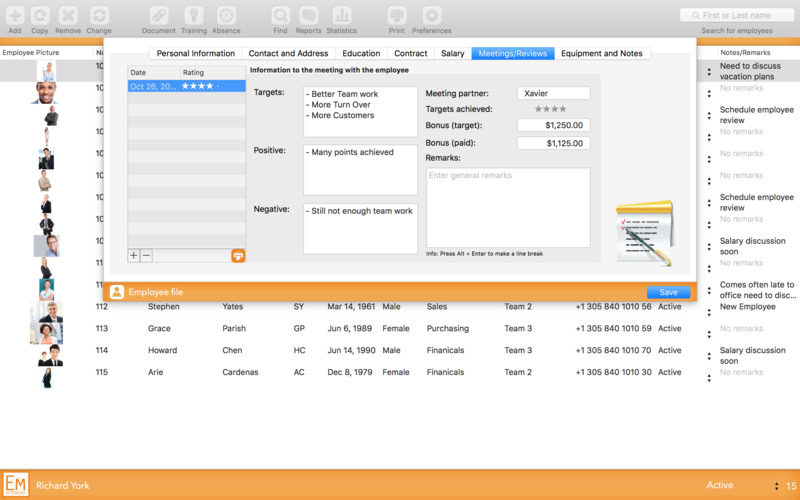 On the spot reports and overview information about your employees! 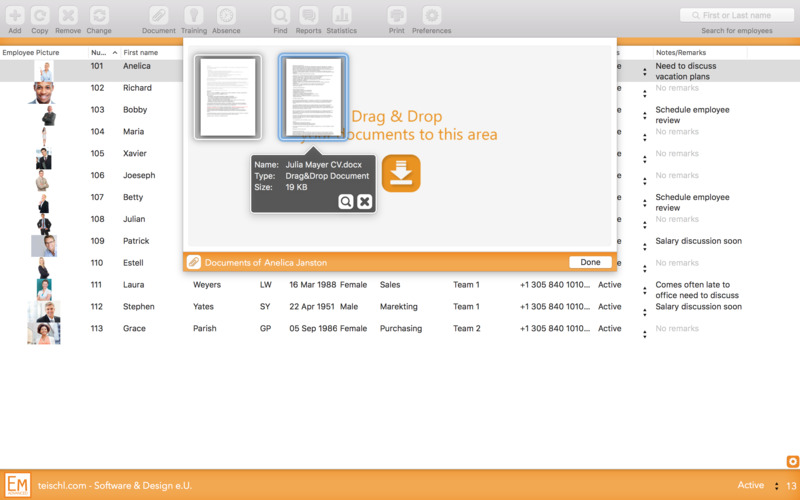 Simply snyc between your Macs with iCloud (Basic & Advanced) or work within your company network and Dropbox (Extended)! Support is a thing..an important thing! May we answer some your frequently asked questions? Where can I order employment:app? employment:app is exclusively available from the Mac App Store! How many employee entries are supported, what makes sense? employment:app is perfect for companies with 5-100 employees. What is the difference between Basic / Advanced / Extended? Well first the price :) - just kidding, we have created a set of different features depending on the needs of our customers. Best is you check out our detailed feature overview that explains the differences! It seems iCloud does not work. Any idea what the problem could be? iCloud can be a difficult problem, first please check you Mac Settings if Document Sync with iCloud is active. Also try to enable and disable iCloud in employment:app and restart the app in between. Suddenly all my data is gone! 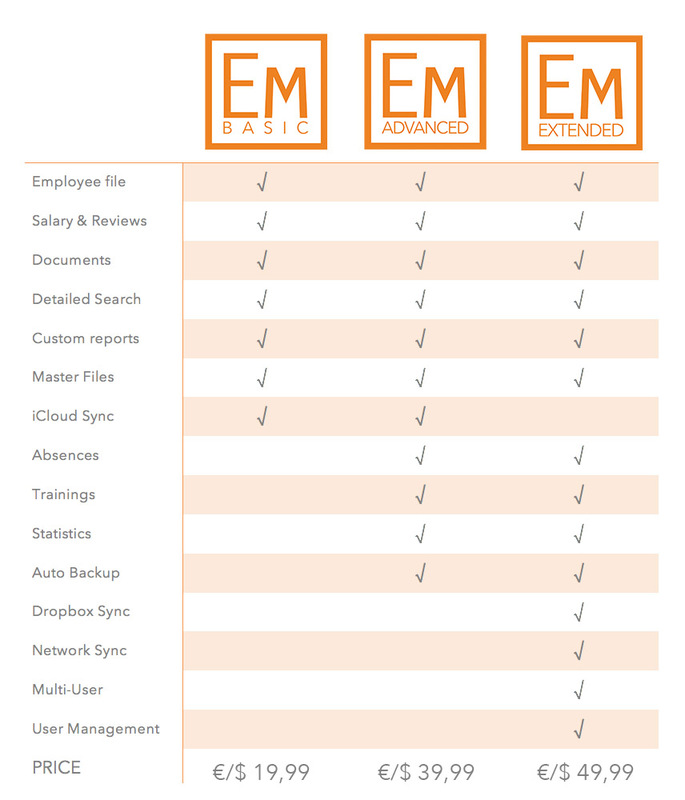 Check the Backups within the employment:app Preferences. 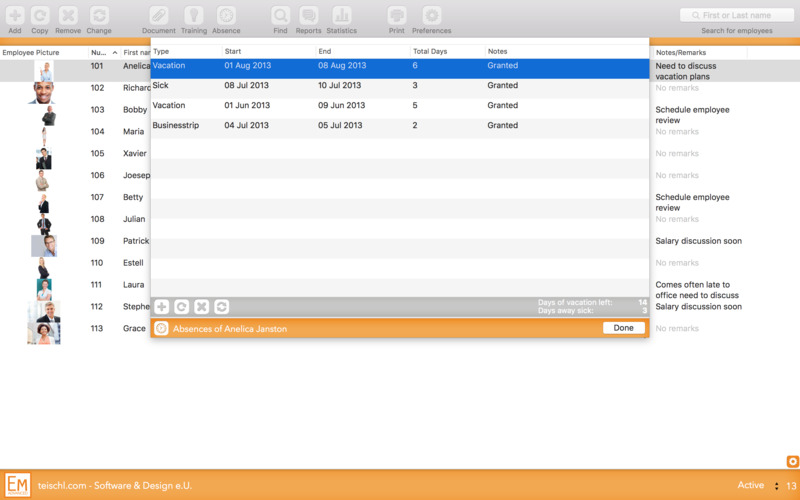 employment:app makes Backups fully automatical every time you start the app. To restore a Backup open employment:app, click on Preferences -> Backup, select the Backup you want to restore and well..click on "Restore"
The standard username is "Admin" and the standard password is "employmentAdmin" however we strongly recommend you change the standard password after your first login! Download your free trial version of employment:app! it is a little limited (you can only create two employees) but should give you a good overview. You like employment:app but you have a few more questions? That's great! Send us an email and we will get back to within the next few business days!